This fanboys' festival draws 10,000 Jeep owners to the slip-rock and sand of eastern Utah over Easter where they test the capability of their modified machines and admire the latest creations from the factory. 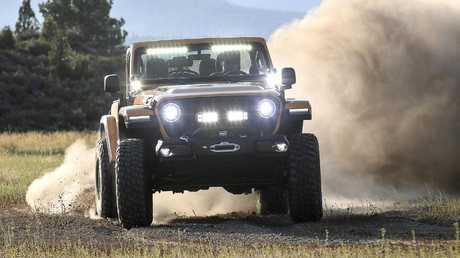 Five cars debuted this year, ranging from by a vehicle inspired by the Baja desert racers to an overhauled Jeep Wagoneer. Jeep bought them out for the media during the launch of the new Wrangler. Unlike the Moab faithful, News Corp got to test them out in their natural environment. Jeep doesn't do show cars, they do go cars. The Jeep Sandstorm desert-racer homage has 35cm of front wheel travel and a massive 45cm at the rear. A 6.4-litre V8 Mopar crate engine has been dropped into the engine bay of the Sandstorm to give this Baja rally inspired creation the grunt to match its prodigious ground clearance. We didn't get to play with the suspension travel across the desert but the sound and sight of the of the 335kW Hemi V8 kicking up dust was enough to give us our just deserts. Fully adjustable Fox xuspension for the converted four-door Jeep Wrangler was tuned by legendary Baja racer Mel Wade, simply because Jeep didn't want to build a car that looked like it could tackle sand at stupid speeds - it wanted the Sandstorm to be capable of achieving it. To conform with the Baja racer look, the rear doors and roof have been chopped to expose the rollcage and let the spare tyre be mounted in the rear. That tyre is a massive 39.5-inch BF Goodrich Krawler, designed for traction in the extreme sand and ruts that form the Baja course. An integrated air compressor lets the driver adjust pressures to suit the speed and terrain. The Wagoneer Roadtrip keeps the bench seats but adds off-road credentials and a 5.7-litre V8. 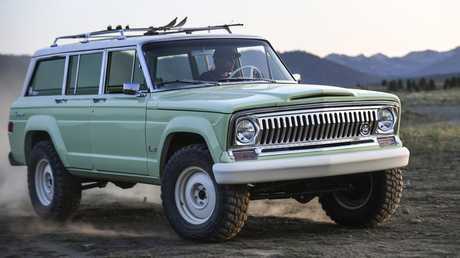 The repurposed Wagoneer looks like a classic Jeep but rides like a really big Wrangler. The original car was spotted for US$5000 by Jeep chief designer Chris Piscitelli and became an extreme extension of one his personal cars. "I'd bought a Wagoneer but I paid more for it and it wasn't in as good a condition," he laughs. "We wanted a modern take on the classic look and I'm really, really happy with how it ended up." The "Wagoneer Roadtrip" sits on a wheelbase stretched by 13cm. The track has also been widened and the wheel wells reshaped to accommodate 33-inch all-terrain tyres. The original six-cylinder engine has been swapped out for 5.7-litre V8, though the valve cover was repurposed as a toolbox mounted on the rear floor. It joins what looks like period-era suitcases but is in fact a cool-box for "softdrinks and the like". The bench seats can be a problem - the Wagoneer Roadtrip is more than capable of tipping all the occupants to one side of the car despite the lap sash seatbelts if you choose to tap that V8 grunt. The Nacho lights-up the Jeep faithful with` 40,000 lumens of military grade accessory lamps. The corn chip-coloured "Nacho" is essentially a mobile billboard of Mopar accessories loaded onto a stock two-door Wrangler. The standard 2.0-litre turbo four-cylinder engine and eight-speed automatic transmission are untouched but the front bumper is a steel "Rubicon" part with integrated winch sitting below a satin-finished seven-slot Mopar grille and aftermarket bonnet. It drives - at least off-road - with all the conviction you'd expect from a Jeep sitting on 33-inch all-terrain tyres, carving around corners and immunising the occupants from ruts and potholes. The LED lights mounted across the front of the car push out a combined 40,000 lumens and the rear "scouting light" changes colour depending on the Nacho's speed to alert vehicles coming up from behind of the approach velocity. The Nacho rides on 37-inch rubber mounted to beadlock rims. A 5cm lift kit ensures they clear the guards. The tube doors are another option in the Mopar catalogue, which runs to 200 parts for the new JL Wrangler. The Jeepster’s chopped roof and raked screen fuse old-school styling with modern dynamics. The Jeep "Jeepster" is described as "a mixture of the present and possible with heritage-inspired styling". The roof has been cut down and the windscreen raked farther back to emulate its 1966 namesake and the look is highlighted by a red/white paintjob. The spare wheel is mounted inside the cabin to maintain the clean, cropped lines. Inside all-weather floor mats _ the most popular product in the Mopar range _ integrate into the Wrangler's standard drainage plugs so owners can hose down the interior after a hard day on the trails. Of all the customised concepts, the Jeepster is the coolest and most practical. There's no sense of lost headroom despite the roof being 5cm lower and it feels just like a Wranger from behind the wheel. A limited-edition run would sell as fast as they came off the production line. The 4Speed has gone on a serious fast to be a fast machine without an engine upgrade. 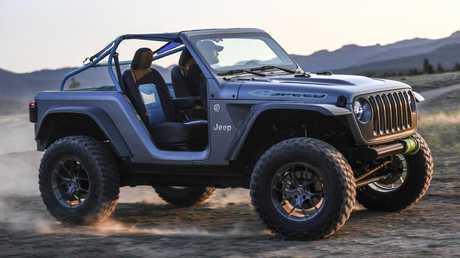 Jeep has been showing lightweight Wranglers for a few years and the 4Speed takes it to extremes. 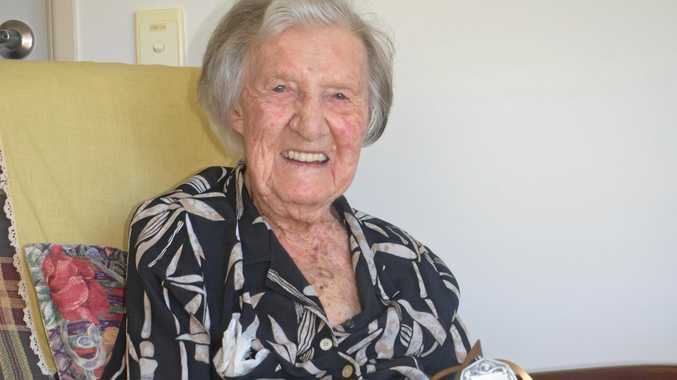 The body has been shortened by 56cm and the doors, roof and rear seats discarded. A carbon fibre bonnet, rear tub and wheel arches also shave kilos, as do the lightweight 18-inch alloys. The 4Speed uses the Wrangler's new 2.0-litre four-cylinder turbo engine and eight-speed automatic transmission hooked up to Dana 44 front and rear axles. The result of the crash diet is an off-roader that goes harder and handles more nimbly than any Wrangler has a right to do. It also points to the potential future for Jeep as tightening emission regulations makes "lightweighting" vehicles and inexpensive way to cut fuel use.